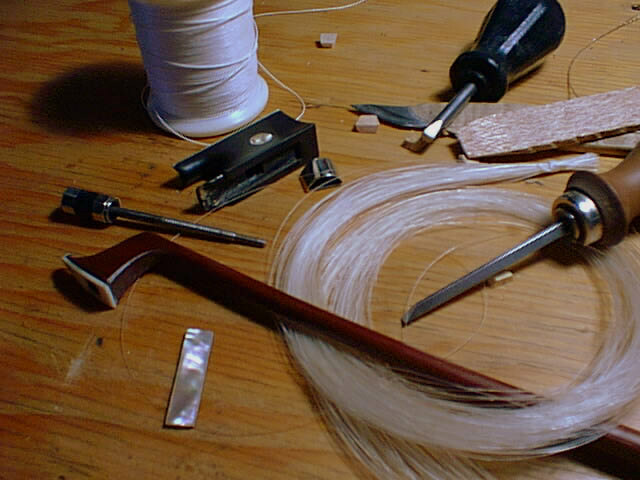 I use the finest quality unbleached white "stallion" Siberian horse tail hair that has been triple drawn and visually sorted. 1. pack your bow in a bow box and then use a shipping tube from FedEx or USPS to box it up safely. 3. choose the type of hair you want on your bow (white, mixed, black), and the thickness of the hair (180 hairs is the normal amount for a violin bow, not too thick). 4. give me 48 hours to rehair your bow. Returning it to you depends on the service you pay for. USPS is the cheapest and slowest, FedEx is the most expensive and most reliable.